The Pinnacle Awards were created in April 1995 by the board of directors of the American Society of Furniture Designers (ASFD). Their goal is to promote design quality, and encourage the recognition of furniture designers within the retail home furnishings industry. This year's ceremony (2017) is on October 16. The ASFD was founded in 1981 and is located in High Point, North Carolina. It is an international, non-profit, professional organization that is "dedicated to advancing, improving and supporting the profession of furniture design and its positive impact in the marketplace". Because of space limitations we are showing only about a dozen of the almost seventy finalists, the rest of which can be seen on the ASFD website. 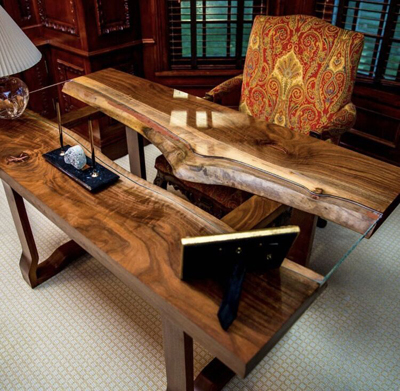 Above is a spectacular Gentlemen's Desk by Andrew Griffing and Daniel Lee of Stamford, Connecticut based Griffin Lee Artisans, LLC. 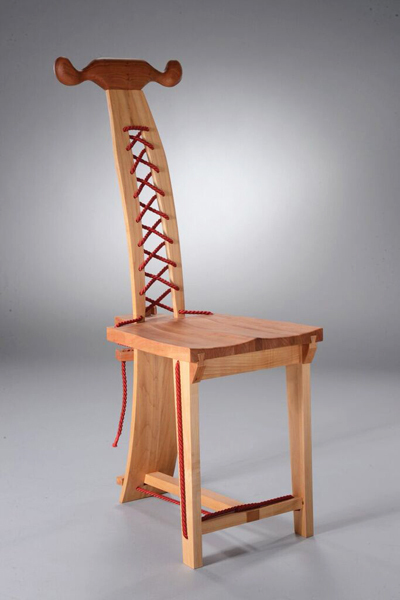 Shown at left is Bell Chair by Xin Chen of Iowa State University, and it is a finalist in the Student category. Originally from China, he is pursuing his MFA and MID at Iowa State. Chen's inspiration is from traditional Chinese culture such as musical instruments and ancient characters, and also elements of American culture such as Native American totems and modernism. His work seeks to reflect the design motifs of a cultural spirit that espouses both Eastern and Western cultural conflict and harmony - which reflects his personal experience. His furniture is assembled with tensioned rope, and can be disassembled into individual pieces. This process of disassembling and rearranging is not just about playing with furniture, but more about inheriting and carrying forward Chinese cultural traditions. This year marks the Pinnacle Awards' 22nd anniversary of celebrating designs that are produced in large numbers for sale to consumers through retail stores. At right, for example, is the elegant Julian's Haberdasher from the Postscript collection by Universal Furniture. This finalist in the Major Collections division is 52W x 21D x 62H. It has eight drawers, plus eight trays behind the two framed glass doors. Products entered must be in current production, and must have been shown and sold at one of the major retail furniture markets worldwide, or be available to U.S. consumers through online, catalog or brick and mortar retailers. Judging is done by a jury of twelve industry professionals and is based on certain criteria of design excellence including form and function, innovation, retailer and manufacturer benefit, and consumer benefit. While the Pinnacle Finalists are released after that round of judging, Pinnacle Winners are not known until the awards banquet ceremony that is held during the fall High Point Market. At left is Panavista Dining by Richard Schroeder and Denis Kissane, for Stanley Furniture in High Point. The company was founded in 1924 by Thomas B. Stanley, a farmer turned industrialist who later became governor of the Commonwealth of Virginia. In 1957, he hosted Queen Elizabeth at his home on her royal visit celebrating the 350th anniversary of the founding of Jamestown, the first successful English settlement on the mainland of North America. Today, the brand still has a strong commitment to design leadership and craftsmanship. The innovative and clever Amora Vanity at right, which was designed by Alex Ginestra for Ronbow, is an unconventional design with multiple storage opportunities. A finalist in the Occasional Storage category, it makes a statement in any setting. The visually stunning look comes from the shapes and cuts of the drawers and doors, giving an almost puzzle-like appearance when opened. 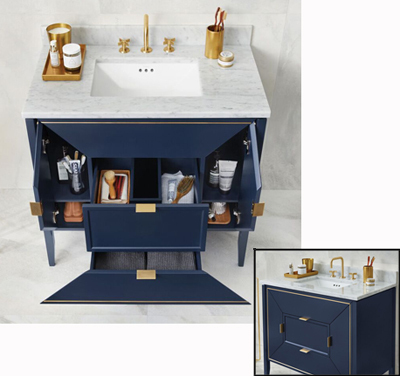 The vanity comes in a signature rich navy finish with brushed brass inlay under a classic Carrara white marble top, with a rectangular undermount sink. It is also available in White or in Oak Toscana, with brushed nickel metal inlays. It is 30" x 36" x 48". Ronbow is based in Fremont, California, and Ginestra is an in-house product designer. He does sketching, 3D modeling, rendering, CAD drawing creation, trend research and finish development for Ronbow's bathroom furniture. His designs "draw from a wide range of styles, but always focus on beauty and functionality". At left are three Molten Brass Accent Tables by Mark and Julie Phillips. Look closely and you'll see that the center of each table, and the expansion crack from there to the edge, is actually filled with poured brass. 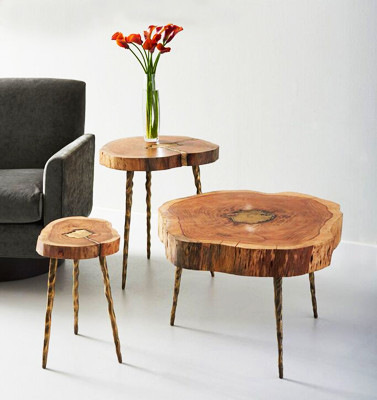 The legs are a freeform, branch-like brass casting, and the tables were finalists in the Occasional Tables category. For thirty years, the Phillips have displayed a striking skill for discovery, from one-of-a-kind treasures to new trends. Starting in Southeast Asia and continuing on to Africa, Latin America, Europe and the Pacific Rim, they've searched the world for exciting products for their design-oriented customers. 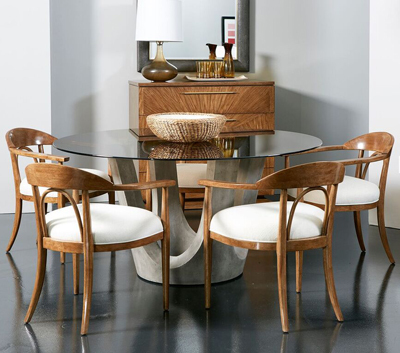 Today, the Phillips Collection continues to define global style for the contemporary market. Introduced in 2010, Green Leaf Award entries can be submitted in any of the fifteen traditional Pinnacle categories. Entries include products that meet the most discerning design standards, while also meeting a legitimately eco-friendly profile. Certain "green" entry criteria apply. Among the finalists this year was Geometry Accent Tables, shown at right, from the Phillips Collection. The catalog describes them as "the perfect blend between organic and contemporary." They are crafted from solid slabs of acacia wood, over a matte black iron base. Clean lines and a diagonal division between materials makes these natural wood tables modern and dynamic. They are available in six sizes. A finalist in the summer casual category, Lloyd Flanders' Wildwood Lounge Chair captures the beauty of teak with an exclusive heather gray finish. Created in-house by the company's design team, it adds comfort with luxurious cushioned seating and padded Lloyd Loom back panels. 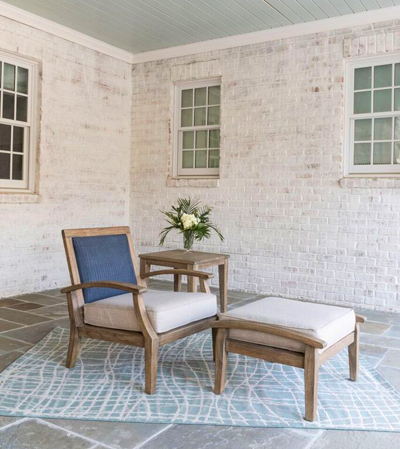 Its smooth transitional details can take an outdoor room to the next level, and the inset back panels are available in any of 20 custom paint finishes. Henrik Pedersen runs a Danish design studio that is focused on lifestyle and ranges from furniture and lighting to clothing and food packaging. "In our design solutions," he says, "we adopt an international approach, since our marketplace often spans the world. Our clients are both Danish and international enterprises, and from many different lines of business. An important aspect of our work is keeping up with market trends, so traveling, exploring and being inspired by the moment are essential to being able to see beyond tomorrow." 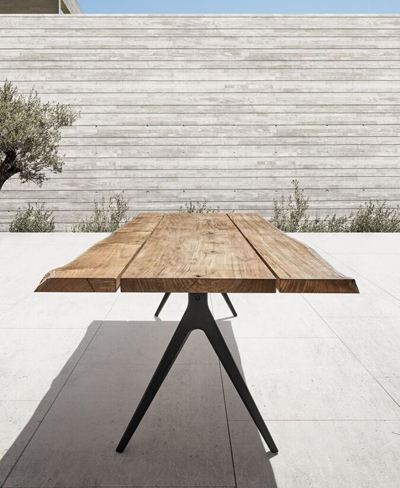 The buffed teak piece at right, called a Split Raw Dining Table, was designed for Gloster's Raw Collection and has contoured or sapwood edges and a powder-coated aluminum base. It is a finalist in Casual Dining. Gloster Furniture GmbH is based in Lüneburg (also called Lunenburg), which is a city of 72,000 in the German state of Lower Saxony. 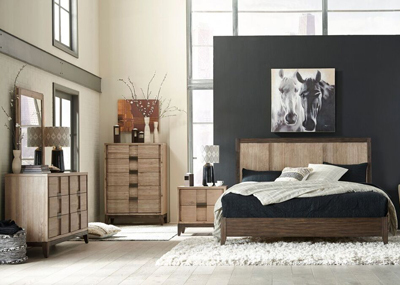 A finalist in the Bedroom division, the Maxwell Collection by Frederic Spector and Alan Antonelli was designed for Casana Furniture Company Ltd. Casana is based in Winnipeg, and says of this collection that it "is the perfect balance of casual style and complex detailing. 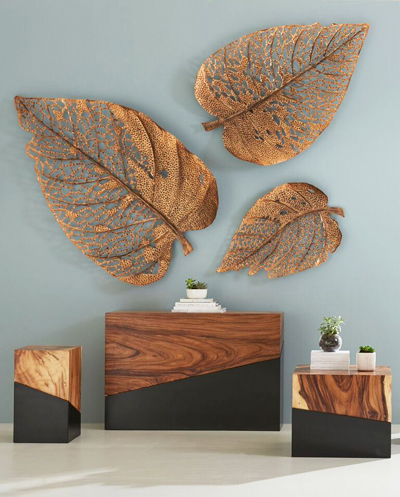 While the saw cuts and wire brushing on the wood allow for a rustic appearance, the two-toned finish and carved detailing in the cases work together to create unexpected sophistication." 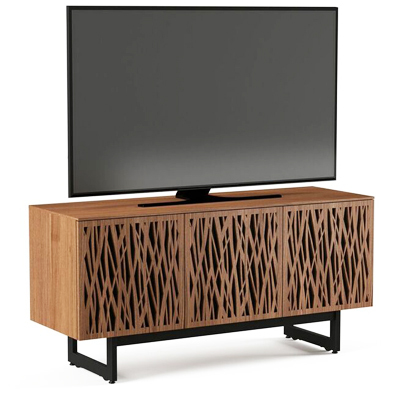 In the Home Entertainment section, Al Glass and Jason Guidry designed the media cabinet at right for Virginia based BDI (Becker Designed, Inc). Part of the company's Elements Collection, its laser-cut doors provide concealed storage while allowing sound, air and remote control signals to pass through with ease. The hardwood veneer comes in six finishes from Walnut to Charcoal, and the legs are powder coated steel. It has hidden wheels, built-in cable management, a TV safety strap and measures 28.75" x 59.25" x 20". Other sizes are available. Professional Members of the ASFD specialize in the design of residential and contract furnishings and accessories. Membership includes both American and International professional designers, trade affiliates and associates, professors and furniture design students. Corporate Members include suppliers of products and services to the industry and furniture manufacturing companies who wish to support the goals and objectives of the Society.